P1 is the rating given to a respirator which meets AS/ NZS1716:2012 for filtering mechanically generated particles, e.g., particles formed by crushing, grinding, drilling, sanding and cutting. P2 is the rating given to a respirator that meets AS/NZS1716:2012 for filtering mechanically and thermally generated particles, e.g. welding fumes. Also for use against bio aerosols such as H1N1 and H5N1 Influenza. Type ‘G’ class rating is suitable for low vapour pressure (below 1.3Pa @ 25oC) organic compounds e.g. many agricultural chemicals like herbicides and pesticides. 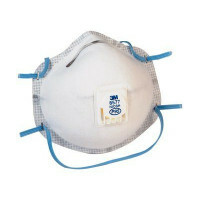 Reduces exposure to harmful airborne particles <100 micron eg. Bacillus anthracis, Mycobacterium tuberculosis, mould, SARS/Influenza virus. Best practice for any Personal Protective Equipment is to ensure the right fit. Proper fitting of a respirator requires the application of an accepted method of fit testing. It is recommended that wearers be fit tested in accordance with Standards Australia’s Guidance document AS/NZS 1715:2009.